Situated on a white-sand beach, this AAA Four Diamond resort offers the elegance exclusive to the most prestigious hotels of the world. 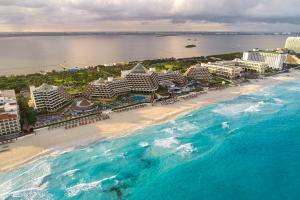 Its 683 rooms comprise a contemporary hotel with Mayan temple-styled architecture. Royal Service: Daily continental breakfast, international bar and hors d'oeuvres, 24-hour room service, private registration and pool area plus upgraded room amenities. Beachfront property, 5 minutes from shopping, 15 minutes from the airport. La Veranda, Ku-nah (Mexican restaurant), Tempo (Mediterranean), La Perla, Café Quetzal, four bars including the Caribe Bar (Exclusive for the Royal Service Pyramid), and 24-hour In-Room Dining. Bullfights, Duty-Free Shopping, Xcaret Eco-Archaeological Park, Tulum, Coba, Chichen-Itza, and Deep Sea Fishing.